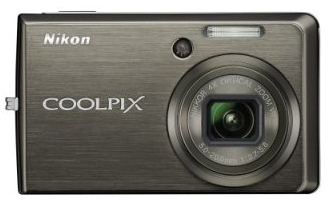 Gathered in this post are summarized links to various professional and user reviews, sample photographs and galleries, reference material and community / forum discussions related to the Nikon Coolpix 10MP digital compact camera. World’s fastest startup time: Nikon claims that the 0.7 second startup time is the fastest among digital compact cameras in its class. Zoom range: A very impressive 4X, 28-112mm zoom range. I consider 28mm the bare minimum that digital cameras should have at the wide end. This allows you to get wide shots in tight spaces, and is useful for photographing groups of people or general architecture and sweeping landscapes. Tastefully-designed metal body: Clean lines and a slim, brushed metal body ensures that the camera fits easily in your pocket or purse. Weight and dimensions are 130g (4.6oz) and 88.5 x 53 x 22.5mm (3.5 x 2.1 x 0.9in) respectively. Memory and storage: 45MB of internal memory is provided. The S600 takes in SD and SDHC memory cards. Power and batteries: The S600 is powered by one Nikon EN-EL10 rechargeable lithium ion battery . The battery is included and a full-charge lets you take about 190 photos by Nikon’s estimation. Unfortunately, the EH-62D AC Adapter by Nikon is an optional accessory that needs to be purchased separately. Terri French uses her Nikon D200 but finds the S600 a very convenient camera to carry around in her purse. Read her impressions of the Nikon S600 and view a larger version of the images. The S600 has a great design — size and build are excellent. The rear LCD is bright and clear. The VR (vibration reduction) mechanism seems to work well. D-Lighting (in-camera dynamic range expansion) works well. Automatic White Balance seems a little cold but can be fixed in post-processing. She hasn’t tried the White Balance presets yet. There is no control for Tone / Contrast. The S600 photos were shot in regular shooting mode with Automatic ISO turned on. They were post-processed. Terri shared another photo — this one was shot with the internal flash. Official Nikon S600 website: This is hosted at NikonImaging.com. You get to read the official specifications there. In addition to the specs, there’s also 24-page, 1.4 MB English Language PDF brochure available for download.